Recently returned from the Modernist Studies Association conference in Buffalo, and while there the Pulp Magazines Project had the opportunity to meet with a book trader, now retired, who started dealing in science fiction and genre magazines in the late 1940s. Needless to say, this was at the dawn of the age of modern science fiction (at least the post-Gernsback era). To put this in perspective, the first science fiction convention was 1937. Regardless, it was a rare treat conversing with him and hearing his stories. Unfortunately, he sold off his pulp collection of 10,000+ items a few years ago, but we did score some interesting things – namely, a collection of bound pulps. These aren’t complete issues, but hodge-podge selections of stories or novels selected and rebound by a fan / collector. Any pulp collector who has been at it for a while will have seen such odd little homemade anthologies, and they usually steer away from them. And (perhaps) rightly so, because for the most part such “collections” are tattered and coverless amateur jobs, bound with a drill and some string or even duct tape and construction paper covers. I find these volumes really quite charming, like pulp scrap books. And for a print or publishing historian, they offer plenty of critical fodder. It is so rare that the modern historian or critic can trace the actual reception and audience or readership for magazines or even books. “Audience” is usually conjecture. This is why so much literary criticism confines itself to the critical reception in contemporary magazines, newspapers, and reviews. But a book critic isn’t the general audience. Literary historians like Michael Denning, Jonathan Rose, and Erin Smith have written excellent monographs that attempt to reconstruct the popular audience, but for the most part these remain conceptual – well, with the exception of Rose who, in The Intellectual Life of the British Working Class, relies upon correspondence and reading diaries. Smith’s Hard-Boiled is a very important book for bringing pulps into the critical spotlight, but it perhaps suffers by being too reliant upon ads, letters to the editors, and studies on the readership of the pulps done at the time, but which were skewed by cultural prejudice. These tools feed into theoretical abstraction as a means to construct the pulp audience. 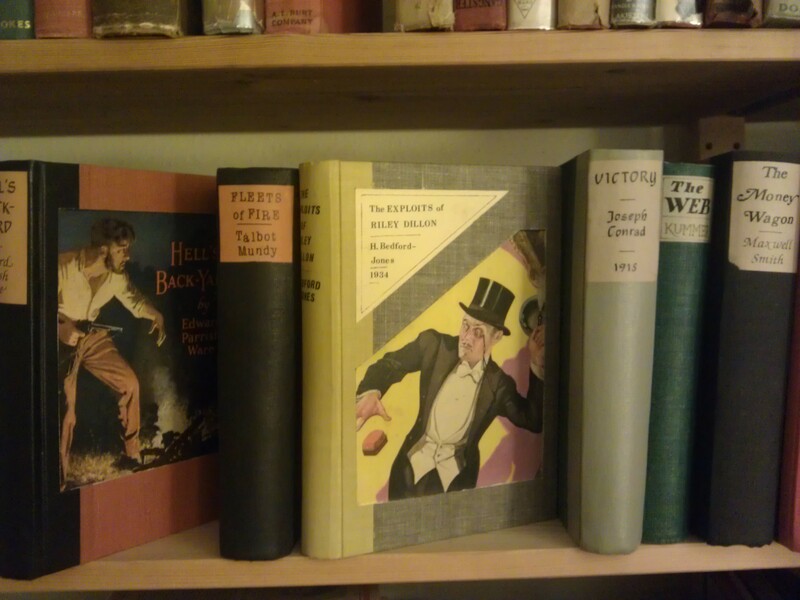 How refreshing then to come across these lovingly bound volumes which mark an effort to not only preserve the fragile material of the pulps, but effectively remediate the pulps. Binding the pulps in this manner is more than an act of collection or canonization, but an act of legitimization which counters the prejudices against the pulp magazines as purely disposable and ephemeral fiction. The person who did these added high-quality end-papers, decorative boards, chose to bind in the original covers, and added typewritten tables of contents. And whereas many pulp collectors and magazine historians would just see these as marred, imperfect, incomplete magazines missing the majority of the ads, departments, contents, metadata, and contextualization, I see them as singular editions. They are evidence of not only active reading, but of text-making. And isn’t this what the pulps, which were always so attentive to their readers’ desires, always invited? These volumes embody active involvement in the texts, in production, and, finally, in preservation. It should be plain to see why we at the Pulp Magazines Project think so.